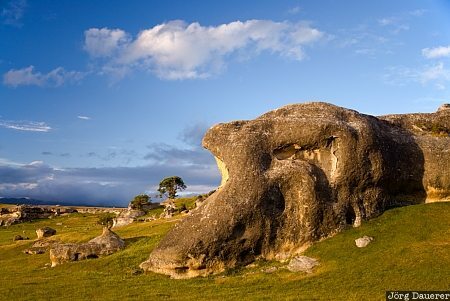 Clouds over the limestone formations "Elephant Rocks" in the Waitaki Valley near Duntroon, Otago on the south island of New Zealand. The "Elephant Rocks" where the backdrop to the movie "The chronicles of Narnia". This photo was taken in the evening of a rainy day in November of 2008. This photo was taken with a digital camera.